The TRÚcomfort Double Electric Breast Pump is a closed-system, double electric breast pump designed for moms who express several times a day. It comes with two collection bottles for expressing both breasts simultaneously. The 4 preset speed patterns (two for letdown and two for milk expression) help mothers best match their baby’s natural nursing pattern and maximize milk production in less time. Each preset pattern has seven levels of vacuum suction, allowing the user to choose the most comfortable and effective vacuum strength. Designed with simple user-friendly controls and an LED display to indicate the current speed setting, expressing milk is easy and effortless. The pump’s closed-system diaphragm provides anti-back flow protection which prevents milk from coming in contact with the tubing or motor. 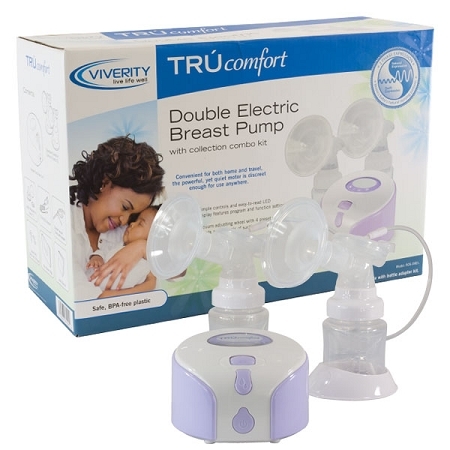 The TRÚcomfort Double Electric Breast Pump has flexible power options for portable pumping for busy moms on the go. It can be electric-powered or battery operated. Fits perfectly into the convenient carrying tote (included) for a complete portable solution.